This is an image for the release, "We almost always buy in the same shops." Consumers are a lot more predictable than they seem. This is the main discovery of an international scientific study, in which the Universidad Carlos III of Madrid has participated, which reveals how to predict people's shopping patterns. This research study attempts to identify just how predictable we consumers are with respect to shopping patterns. As explained by one of its authors, Esteban Moro of the Department of Mathematics at UC3M, "the main conclusion we have drawn is that people's behavior is repetitive when it comes to visiting and spending in shops, and as such it is possible to have some success in predicting where we are going to buy in the future". Published in Scientific Reports, the open journal of the Nature group, the study was also produced by scientists from the Universidad Autónoma de Madrid, the University of California in San Diego (U.S.A), M.I.T (Massachusetts Institute of Technology) and NICTA (Australia). In order to carry out the study, researchers analyzed hundreds of thousands of de-identified economic transactions made with credit cards on both sides of the Atlantic. The goal was to find the ´predictability' of the time series of consumption in almost a year's worth of credit card purchases made by more than 50 million accounts. "What we found"- the researcher points out- "is that people are quite regular when visiting (and purchasing in shops and that there is quite a bit of ´predictability', above all in the long term". To put it another way, it is difficult to predict where your next purchase will be on the basis of where you are doing your shopping now. However, as Professor Moro indicates, it is possible to know with a fair degree of probability where you will go shopping during the next month. In short: we go back to the same shops with remarkable regularity. As pointed out by the researchers, the study has various applications that range from geomarketing (marketing in specific areas of the city), provision of points of sale, locating cash tellers or detecting fraud. There is still not enough information available to the researchers as to whether this data can be extrapolated to cash operations. Over the past few years there has been a good deal of research on the 'predictability' of social behavior. 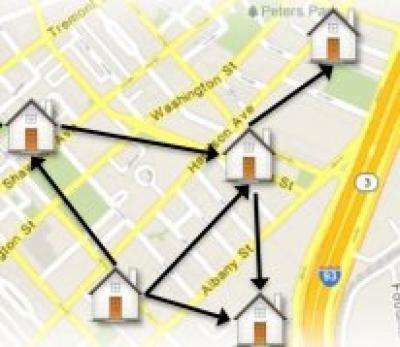 By using different data sources (telephones, Wi-Fi points, GPS data, etc. ), many groups of scientists have studied how predictable our mobility is- that is, the routes, walks and places that we use to move about in the city. While this mobility is determined by the tasks we have to carry out throughout the day (going to work, going home, etc. ), there are also many variables throughout the day that are not completely predictable (where to, take out money, etc.). As Esteban Moro puts it, "our goal was to try to observe to what extent this 'predictability' also exists in economic decisions (how much and where I use the credit card). Although they are conditioned by our daily mobility, these decisions have a completely different dimension."